Self portrait in Vakil mosque in Shiraz, Iran. When I was young, I never really thought of myself as a very creative person. I couldn't draw or paint... and my strengths were in the more analytical world. I remember getting a camera when I was around 13 or so... one of those long flat ones with the big flash pods that plugged into the top. The height of creativity with that was when I went through a phase of taking pictures with the horizon tilted 45 degrees. That all changed with digital around 2001, where I had the freedom of seeing what I was capturing right away, and could quickly learn as I experimented. For the past ten years, my photography, partially fueled by my travels, has really taken on a life of its own. And with that, become a big part of my life. My cameras have joined me through more than 40 countries and all 7 continents, and I've gone through several through the years. Here's a look at what is currently in my bag. This baby is as close to a real child as I plan to have, and oh do I love it dearly... at least as much as you can love a camera. I really appreciate the smaller size that the camera offers over my old gear, and the quality is tops. I particularly love the EVF (electronic viewfinder) that allows me to see what I'm going to get as I'm messing around with odd "artsy" lenses and freelensing. I also appreciate the in-body stabilization which gives me a little more flexibility when I'm shooting handheld (which is most of the time). Another game changer is the WiFi functionality that allows me to quickly send images I've taken to my mobile phone. This is one of the main reasons why I now post to Instagram so much more often now. I moved to Sony mirrorless in mid-2015 after waiting for the perfect time to switch from my DSLR. After shooting with Nikon for about 10 years, there was a steep learning curve as I had to adjust for all of the muscle-memory, but I really don't miss the old gear at all. I remember taking this out for the first time, and thinking to myself "this is the nicest lens I have ever shot with." That still rings true to me. It's crazy sharp, with absolutely lovely color and bokeh. I particularly love it for portraits and low light work since it's so bright. Maker of traditional parasols in Nyaung U, Myanmar. 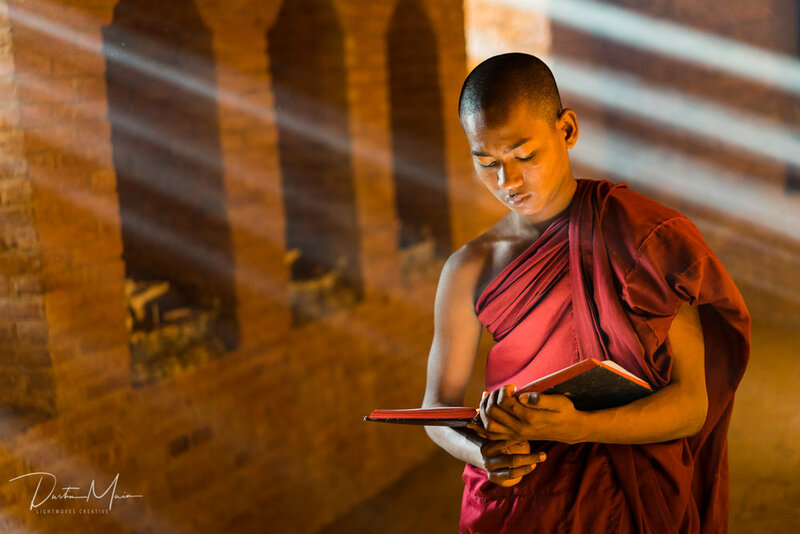 A novice monk in Old Bagan, trying to decide the direction his life will take. This is the lens that is most often on my camera when I'm walking about, especially given the small size and unique lens hood that allows me to pop it in and out of my bag without having to worry about the lens cap. Like the Zeiss 55 above, it's really sharp and a joy to use. This is my longest lens, and not something I carry around with me all of the time, even though it's still much smaller and lighter than the faster f2.8 model. Still, after shooting with the smaller prime lenses above for awhile before I picked this up, you can understand how I would get used to having a smaller camera / lens combination to take around. It's been great to have a bit more telephoto from time to time though, and after shooting at those medium lengths for quite some time, I've become more creative with the flexibility that this lens offers in a way that I wasn't before. My newest lens is my widest, and something that I picked up in early 2018. Like the 70-200 above, the focus and zoom is all internal, which I really love for durability and cleanliness. I'll be sharing more shot from this lens soon. I also sometimes carry a pair of more artsy Lensbaby lenses, though I usually only break them out when I'm looking for a creativity boost or have a unique project. I carry a Velbon UT43D tripod with me. I've had this one for quite some time (5+ years), and it did take awhile to find the perfect one for me. Small, lightweight, full height (if I want) and quick to setup. For me, this means that if I'm debating on bringing it out or not, I often do because I know it's so quick and easy. Update: Unfortunately my tripod was stolen in January 2018, but I'll be replacing it with the exact same model in the USA later this year. It's hard to find this particular model around the world! Believe it or not, I carry my camera in a $3 cloth bag from Myanmar, and it's awesome. I've had a tailor add some padding to the bottom and sides, and add an interior lining with zipped pocket. The across-the-body design allows me to quickly pull the camera out of it (a little like a holster) while still making it easy to maneuver through crowds unlike with a backpack. It's large enough to carry my camera with an extra prime lens, wallet, extra battery and remote. I don't use a camera strap anymore, but if you do I recommend BlackRapid. I carry a Dell XPS 13 notebook computer with me. I love the high-resolution, edge-to-edge screen that makes it significantly smaller than most 13" notebook computers. The aluminum / carbon fiber shell feels rock solid compared to my old Asus notebook as well. On here, I use Adobe Lightroom Classic CC for cataloging and editing my images. My current mobile phone is a OnePlus 3. I don't use the camera much, but with the help of the wifi on my Sony A7ii, I do find it really handy for posting images to my Instagram. Now if you're looking for the exact camera to buy, I can't help you. Everyone is different, and what works for once person won't be the right fit for another. What I can tell you is why I chose the gear that I carry with me. I chose to switch to Sony a few years back because I preferred it to the Fuji gear I tried (Fuji XT-1). I found the Sony to be more customizable and take better video, but a really big part of it was how it felt in my hand. I used both for a month or so, before deciding to go with the Sony. I shoot mostly with prime (fixed) lenses for a few reasons. They're smaller, lighter, and more creatively versatile. Most importantly, they are a lot less "in-your-face" than your typical fast "zoom" lens, and that makes a huge difference when you are taking pictures of people. I don't carry specialized camera bags because they scream "I'm full of expensive camera gear!" and I don't like feeling like a target. I also like to slip my camera into my bag when I'm not taking photos so that when I interact with people I meet, I'm not just a walking camera to them. You girl tossing freshly picked olives into a bucket in Northern Jordan.